Rhodar, one of the UK’s leading asbestos removal companies and headquartered in Leeds, has been recognised for its innovative, unique asbestos removal project for Great Western Railways (GWR) in Penzance at the 2018 UK Rail Industry Awards (UKRIA). Rhodar won the award for “Outstanding Projects (under £3m)”’ at the awards ceremony held at Battersea Evolution, London. The event, now in its fifth year, brought together leaders and decision-makers from across the rail industry. 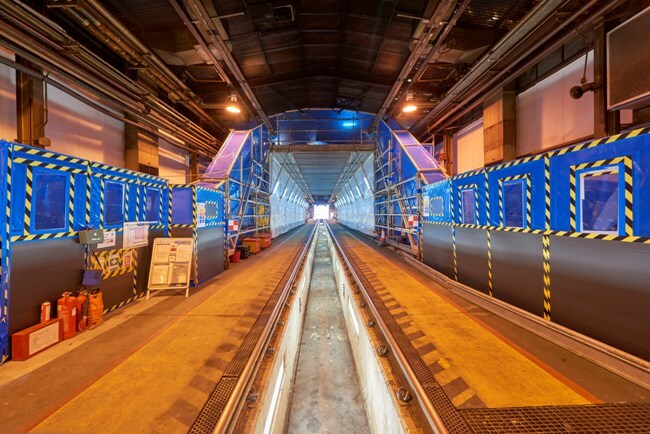 The winning project was a collaboration between Rhodar, its client Spencer Group and Great Western Railways (GWR), which had a requirement for the safe removal of asbestos containing materials from one of its vast 192m HST (High Speed Train) maintenance facilities based in Penzance. Rhodar developed a specialist solution that allowed the safe removal of the asbestos, without impacting on the critical train maintenance schedule. Utilising a unique, multi-level scaffold enclosure system, which was erected inside the maintenance facility and operated on a bespoke set of purpose-built tracks, Rhodar worked systematically through the depot (from one end to the other in 11 planned sections) by locking the scaffold system down in each section, sealing the specialist asbestos enclosure walls and floor, and attaching the moveable airlock and bag-locks. Rhodar faced a number of challenges during the project, including adverse weather conditions on the south west coast and an increase in planned train movements through the HST maintenance depot. Both had to be overcome in order to ensure the strict overall programme and timescales were met, enabling follow-on facility refurbishment works to be carried out on schedule. Jason Davy, managing director, Rhodar, said: “We are extremely proud to win this award. It goes without saying that it is down to the excellent team of professionals and their continuous improvement and operational competency. The UKRIA event had 29 categories, and in the Outstanding Projects (under £3million) category, Rhodar was one of seven nationally recognised organisations to be shortlisted as a finalist alongside major rail and construction companies. The award recognises the hard work and achievement of Rhodar colleagues and partners to support an efficient and robust rail network, which continues to be one of the safest in Europe.